Moral of Aesops Fable: "You may share the labours of the great, but you will not share the spoil." They hunted and they hunted till at last they surprised a Stag, and soon took its life. "Quarter me this Stag," roared the Lion; so the other animals skinned it and cut it into four parts. Then the Lion took his stand in front of the carcass and pronounced judgment: "The first quarter is for me in my capacity as King of Beasts; the second is mine as arbiter; another share comes to me for my part in the chase; and as for the fourth quarter, well, as for that, I should like to see which of you will dare to lay a paw upon it." "You may share the labours of the great, but you will not share the spoil." 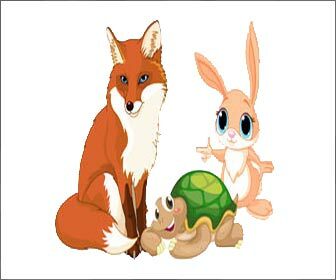 "The Hare and the Tortoise" and "The Lion's Share"